Wasatch Photonics’ Cobra OCT spectrometers fit a surprising amount of resolution, performance, and value into one small box. Beginning with our world-class volume phase holographic gratings, we’ve applied our expertise in spectroscopy to the unique needs of optical coherence tomography (OCT). Our compact, high-throughput spectrometer designs provide exquisite detail at depths where other SD-OCT spectrometers struggle. Ideally suited for use in both research and OEM applications, Cobra spectrometers offer many clear advantages over other devices: compact size, high throughput, minimal polarization dependence, optimal camera design and excellent roll-off performance. The Cobra spectrometer line’s unique engineering and optical design allow us to provide all of these features at a surprisingly affordable price, simplifying the decision of buy vs build. Learn more about how we optimize our spectrometer performance. Whether you have a new application or an existing system, contact us at +1 919-544-7785 or info@wasatchphotonics.com, and let our expert team help you to design your ideal system. 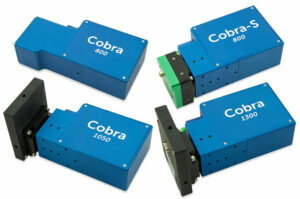 Cobra OCT spectrometers can be customized for a variety of applications. These spectrometers can achieve imaging depths of over 12 mm, at imaging resolution below 2 µm, with spectral width greater than 500 nm and spectral resolution below 0.02 nm. Cameras options include Basler Sprint, Dalsa Piranha, Awaiba Dragster, e2v Octoplus, and more. Contact us at +1 919-544-7785 or info@wasatchphotonics.com to discuss your specific application.